Isaiah Sanders of Timber Creek drives against Jalen Gaffney (12) of Westtown during the third quarter at the Play-by-Play Classic basketball tournament. Isaiah Sanders has played in hundreds of basketball games in his life, in youth leagues and travel ball, in AAU competition and high school events. Something was different for Sanders in the quiet moments before Timber Creek's season opener against Paul VI. "I wasn't nervous," Sanders said. "Every game I ever played in, I always had butterflies before the game. This time, I remember thinking, 'I don't feel nervous. I feel confident.' "
Sanders, a senior swingman, attributed his relaxed state of mind to his status as a seasoned veteran – and his confidence in similarly experienced teammates. With four seniors leading the way, Timber Creek has put together one of the best regular seasons in program history, capturing the Olympic Conference Patriot Division title ahead of preseason No. 1 team Shawnee, compiling a 16-5 record, and earning the No. 1 seed in the coming South Jersey Group 3 tournament. It's been a team effort for the Chargers, the No. 5 team in the Inquirer Top 25, with Sanders and classmates such as Maurice Murray, Dylan Elliott and Ricky Martin leading the way. But it's also true that perhaps the most improved player on one of South Jersey's most improved teams has been the 6-foot-4 Sanders, who has harnessed his elite athletic ability and dynamic skill set in his final scholastic season to begin to realize his potential more fully. "It's his confidence level more than anything," Timber Creek coach Rich Bolds said of Sanders' improvement. "He's more confident. He's more of a leader. He's more seasoned. He's been in the fire. "He's becoming the player we always knew he could be." It's not as if Sanders has burst from the shadows. 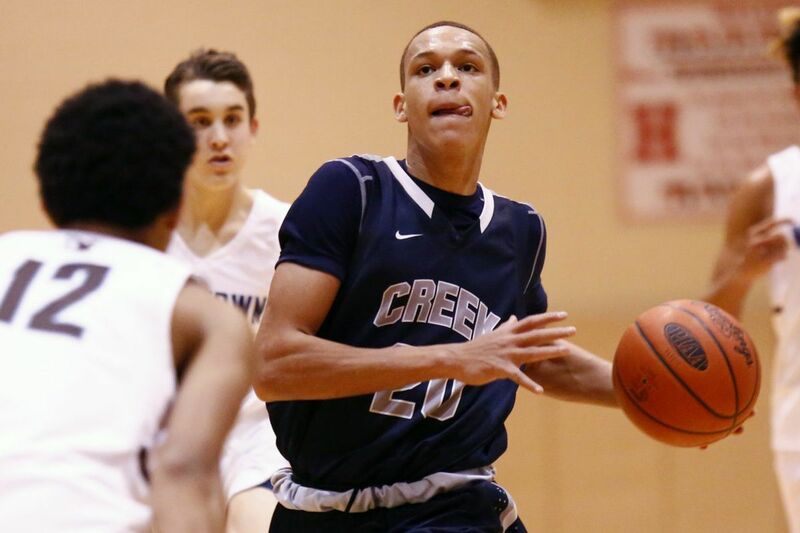 He was a standout player for the Chargers as a junior, averaging around 18 points with a handful of big games, including a 31-point performance in an upset of second-seeded Highland in last year's sectional quarterfinals. "I think he's built on the confidence he got during that playoff run last year," said Bolds, whose team entered the tournament last season as a No. 10 seed with a 9-14 record but advanced to the South Jersey Group 3 title game. Sanders also played some meaningful minutes as a sophomore for a top 10 team that featured senior standouts such as Randy Bell and Caleb Bowser as well as Murray. But this season has been a breakthrough for Sanders and the Chargers. He unfurled the best scoring performance of his life Saturday night against Penns Grove in the Paul VI Winter Classic, generating 41 points in a 103-73 victory. "I should have had 50, but Coach [Bolds] took me out," Sanders said with a laugh. "My shot kept going in." Sanders scored 22 points in a loss to Shawnee on Tuesday night. He showed his versatility with a pair of three-pointers, some strong drives to the rim, and 6-for-6 shooting from the foul line. Sanders would have scored 24, but a tap-dunk that brought Timber Creek spectators out of their seats was ruled to be offensive goaltending. Sanders said his improvement comes from a surge of confidence rooted in his experience and trust in his teammates. It's also the product of a summer of hard work. "After the way we lost last season, we all worked so hard this summer to be ready for this season," Sanders said. Bolds said Sanders has increased the accuracy of his three-point shot, refined his ball-handling and become more dynamic in attacking the rim. Another factor has been the play of the 6-6 Murray, who might be South Jersey's most pure scorer. In an impressive 79-67 victory over No. 9 Eastern on Jan. 30, Murray focused more on being "a facilitator," according to Vikings coach Kevin Crawford. Sanders led all scorers with 21 that day, but four other Chargers reached double figures. "That's something we've talked about all season," Bolds said. "When 'Mo' does that, when he acts as a facilitator and drives and kicks, we're all better for that. Isaiah has been a big beneficiary of that, but the big thing with him is he's been able to take advantage of these new opportunities." Sanders, who will play next season at Notre Dame College, an NCAA Division II program in South Euclid, Ohio, said he hasn't been nervous before a game since he noticed the absence of that familiar knot in his stomach that Dec. 16 afternoon at Cherokee. He knows the biggest games of his high school career might be ahead as the Chargers enter the state tournament with some extra incentive. Sanders and the rest of the Chargers seniors have watched rival Winslow Township win the South Jersey Group 3 title in each of their first three scholastic seasons, eliminating Timber Creek in to-the-wire games in both 2016 and 2017. The teams from opposite sides of Cross Keys Road in Sicklerville are on opposite sides of the bracket in this year's tournament and could meet for the third time this season – and 10th time in the last three seasons – if Timber Creek holds serves as the top seed and Winslow Township works some of its patented tournament magic as the most dangerous 10th seed since … well, Timber Creek in 2017. "We're focused on one game at a time," Sanders said. "But we feel like we've been in every situation. We know everything that can hit us. We feel like we can handle anything."